An open secret for years is that teaching isn’t what it used to be. In fact, having been targets for so many years, most teachers have had it and would love to retire if they could afford it. But after years of cuts, that’s not possible for most. With morale so low, its not surprising to see that word is getting out. A piece in the Capital News Service illustrates this new truth, and a secondary impact. 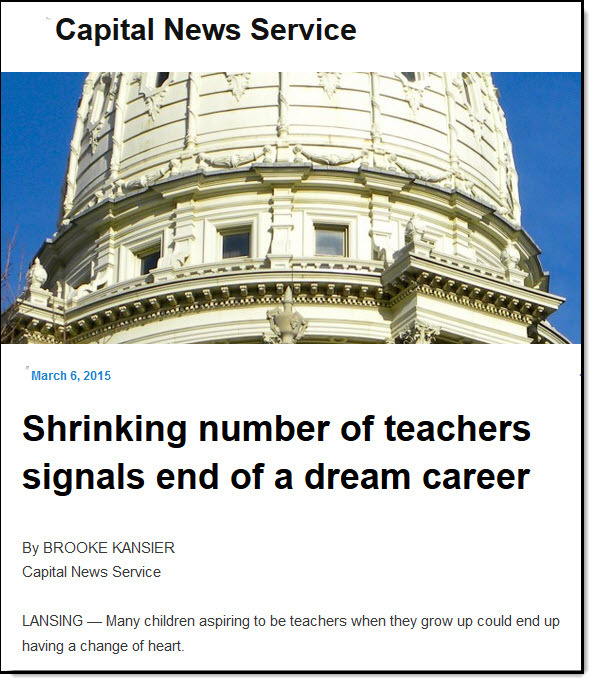 Shrinking number of teachers signals end of a dream career shows that it’s not just today’s teachers that want out, but tomorrow’s. In the wake of the Great Recession, many states passed laws reducing teachers’ job security, cutting their salaries and benefits, increasing class sizes and limiting their collective bargaining rights. At some point, people will realize that the current round of teacher-bashing is counter-productive to the well-being of our society, and it will change. But will they realize this in time…?